Captain Collins-Williams of the Port of Newhaven is now the proud owner of a GeoVS Portable VTS System supplied by SRT Marine System Solutions Limited. The SRT Portable VTS is a full feature standalone vessel tracking system with real-time dynamic 3D and is ideal for use as an emergency backup or as a flexible mobile monitoring system. 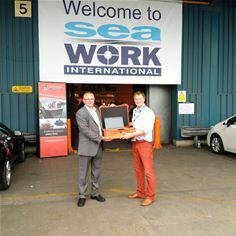 Captain Collins-Williams won the system by making the closest estimate to the actual retail price of £14,000 at the recent UK Harbour Master Seminar in Edinburgh. The integrated high performance AIS receiver feeds the GeoVS display system with live data providing full 3D graphics and vessel information. Contained within a ruggedized and weather proof case, the Portable VTS System can be deployed in minutes and will operate without external power supply for several hours. Captain Collins-Williams said “The addition of the SRT GeoVS Portable VTS will enhance the efficient operation of the Port of Newhaven and the bonus of real time dynamic 3D will aid the understanding of any potential incidents and further improve safety”.